Friendship Donations Network is celebrating 30 years of rescuing food and reducing hunger since Sara Pines founded our organization in 1988. Join us for the FDN Fall Feast, our first signature fundraising event. Cost is $45 per person ($25 is tax deductible). All proceeds benefit Friendship Donations Network. Local chefs will prepare a delicious 5-course feast from rescued ingredients. The ticket price includes hors d’oeuvres, soup, salad, two main dishes, and dessert. Beer, wine and non-alcoholic beverages are also included. And all served in the beautiful setting of the New Park Retreat and Event Center! 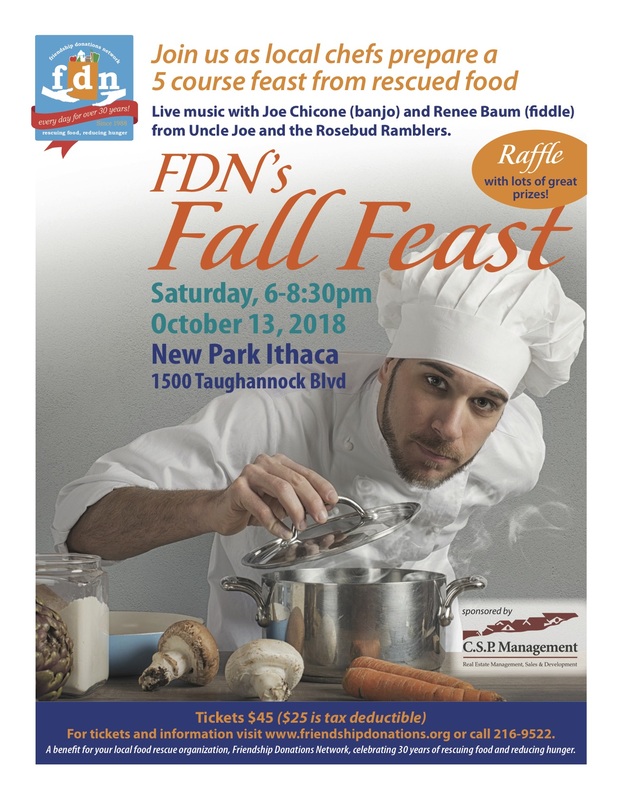 Entertainment includes live music with with Joe Chicone (banjo) and Renee Baum (fiddle) from Uncle Joe and the Rosebud Ramblers, and a raffle featuring great items from local businesses. Thanks to CSP Management for being the main sponsor of this event. Help us spread the word! Share our Facebook event page.